One of my nearby beachside suburbs in Adelaide is Glenelg. 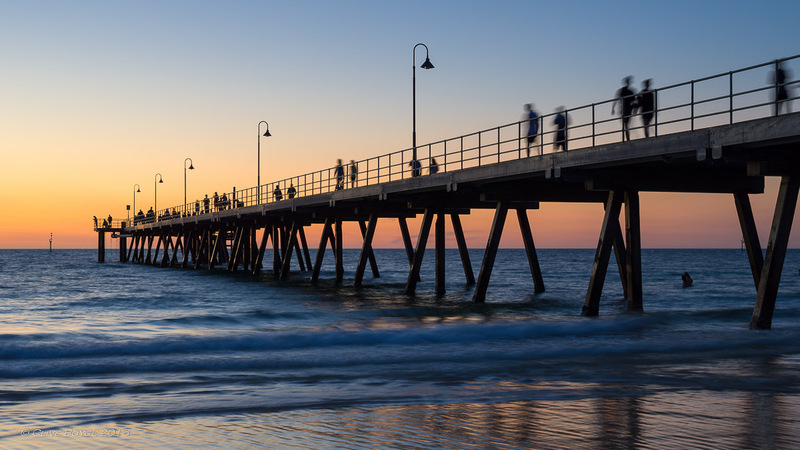 Located at the end of the tram line from Adelaide’s city centre, Glenelg has long been a popular spot for both Adelaide residents and visitors to spend time down at the seaside. For me, in summer particularly, it’s a great spot for some sunset and dusk photography and I find myself down there from time to time with camera in hand. Back in January, I started a month long photo challenge at a photography website I frequent. The idea of the challenge is to nominate a particular lens and then, with that lens, take and post a photo every day through that month. Sounds easy, but keeping up the discipline can be surprisingly challenging as the month wears on. My January challenge failed miserably after only a week or so, but I did get some nice photos of Glenelg at dusk along the way. While the Glenelg foreshore area provides a few different subjects and scenes for the photographer, on the evening of my visit I concentrated on the jetty and those promenading along it. The first five of the following images were taken with my challenge lens for the month, an old (as in late 70’s/early 80’s) Pentax M 35mm F2.0 lens mounted on my Pentax K-3 camera. 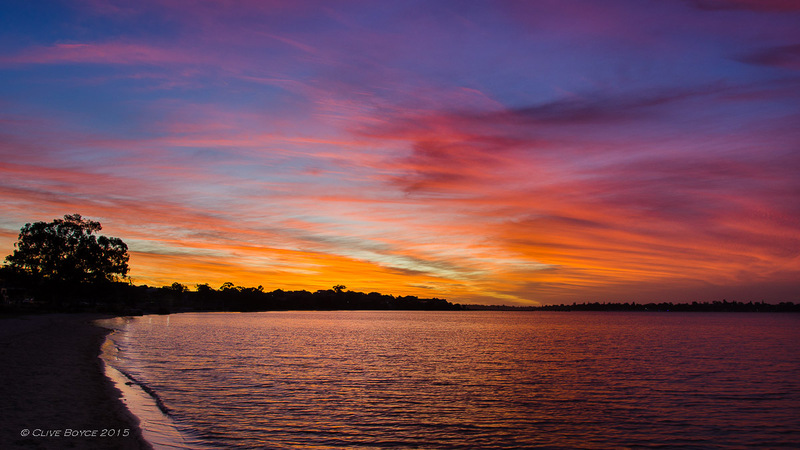 This entry was posted in Adelaide, Australia and tagged Adelaide, Glenelg, Jetty at Dusk, Pentax M 120mm F2.8 lens, Pentax M 35mm F2.0 lens, places to visit, Seascapes, South Australia, Sunset on February 15, 2016 by aussiesouthlander. Today’s post is a flower picture. But not just any old flower. The titan arum, aka the corpse flower, is one of the world’s rarest, largest and unusual flowers. Native to Sumatra, Indonesia, the titan arum was discovered in 1878. It has been cultivated subsequently in botanical gardens but flowers only intermittently. So intermittently that the flowers tend to be given a name to mark the occasion. For the first eight years or more of its life, the titan arum grows a single branched leaf on a long stem that can be six metres or so high. During this time, the plant develops an underground corm in excess of 50 kilograms. It then enters a long dormant period while the flower forms in the corm. Somewhere around its tenth birthday, a single flower emerges. 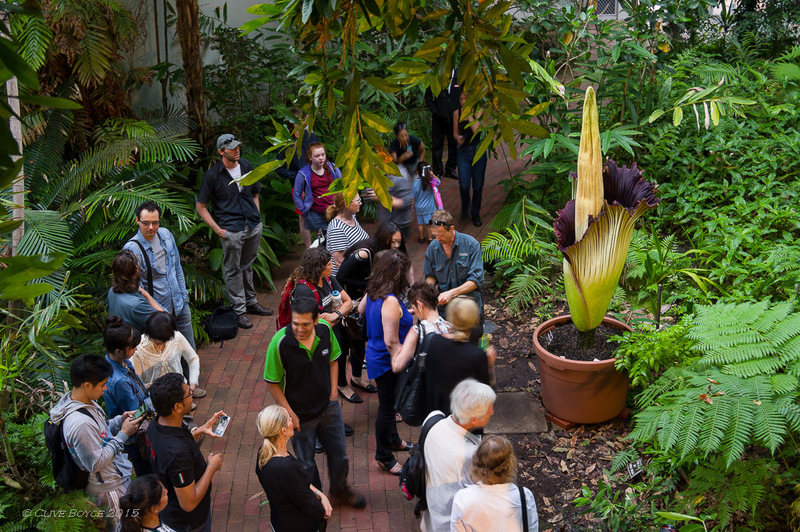 The Adelaide Botanic Gardens has quietly been growing titan arums from seed donated back in 2006 and this year has been rewarded with not one but two flowering plants. The second flower opened on 1 February 2016 and the conservatory in which it was located remained open until midnight that evening for visitors to observe the flower. I drove there around 10:30pm, took a look at the length of the queue to get in, and kept driving. I was keen to see the titan arum, but not that keen! So I popped back the following afternoon after work and was able to walk straight into the conservatory. So meet Ganteng (which is Indonesian for handsome). Very nice you say, but why the corpse flower? 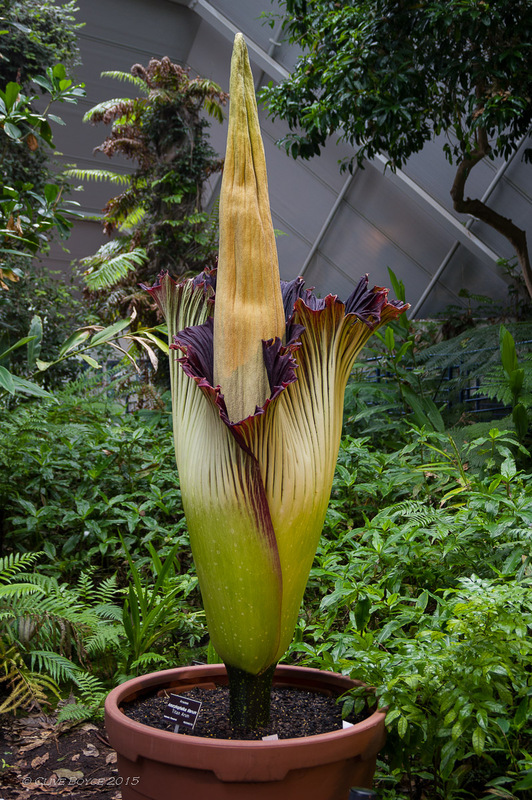 Well, for the day or two it opens, the flower emits a strong odour described as a heady mix of onion, smelly socks and rotting fish. Not a pot plant for the dining room table! It does this to attract pollinating flies and insects to come and visit during its short life. The ‘petal’, which is in fact a leaf, is also deep maroon in colour on the inside to convey the impression of carrion. Not only that, but the centre stalk warms itself to around human body temperature to further embellish the charade. The peak of the pong comes during the first evening when it is believed the titan arum’s preferred pollinators are most active in the jungle night. The true flowers that the insects must find are quite small and hidden deep inside at the base of the stalk. Quite some specialisation! Ganteng, as shown here, is finishing its flowering after a day and a half, the petal is slowly closing for good, and the pong has largely dissipated. Tomorrow the whole structure will start withering away and the corm will enter another rest period before throwing up another single leaf somewhere in the next year or so. Re-flowering will occur, with any luck, in two or three years time, but could also be as long as another ten years. As I wrote at the start of this post, titan arums flower ‘intermittently’. This image gives you a better idea of the size of the flower. Ganteng measured just over 2 metres tall. Impressive, but some way to go to match the largest ever grown in cultivation which came in at a little over three metres. So there you have it, today’s flower photo. Is any one else left thinking of Audrey II from the Little House of Horrors film? Wikipedia’s article on the titan arum can be found here. The scientific name of the plant is Amorphophallus titanum while the popular name “titan arum” was invented by the broadcaster and naturalist Sir David Attenborough for his BBC series The Private Life of Plants, in which the flowering and pollination of the plant were filmed for the first time (I do remember that segment from when it was broadcast in Australia). I’ll let you deduce from from the Wikipedia article why he decided a name make-over was considered necessary. You may also wish to keep ‘Amorphophallus titanum’ in store as a suitable put down for the annoying person inevitably encountered at office Christmas parties! 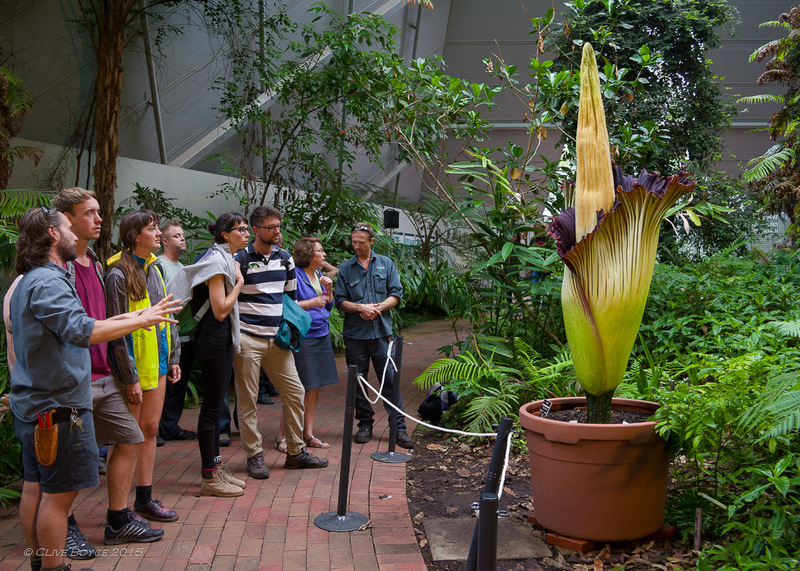 This entry was posted in Adelaide and tagged Adelaide Botanic Gardens, Amorphophallus titanum, corpse flower, South Australia, Titan arum on February 3, 2016 by aussiesouthlander. Well, what happened to Photo Morsels in the second half of 2015? My previous post was way back in July and now it’s less than a day before 2016 arrives. It seems odd writing this now in the middle of some 38°C weather but winter this year seemed cold and dreary, prompting me to stay in the warm part of the house rather than wander into the not-so-warm room which houses my photo-editing computer. So there went July and August. Then it seemed like I was in any timezone other than my own for a couple of months, mostly work trips but a little holidaying also. So here I am in the last day of the year. Although there have been no new Photo Morsels posts for a while, I’ve still been busy with my camera, and in coming weeks will look to share some of what I captured over 2015. T’is the festive season, so first up, Merry Christmas and a happy new year to Photo Morsels readers. And sticking with the seasonal theme, I share with you an Adelaide Christmas tradition, the Brewery Christmas lights, a favorite of small kiddies since 1959. Nothing too flash in the context of modern era and its wizz bang technologies, but for the target audience of 3 to 10-ish year olds where everything in the world is new and exciting, it remains a great family evening out. Simple, ageless displays that remain thankfully free of trade-marked characters from Disney and the like. 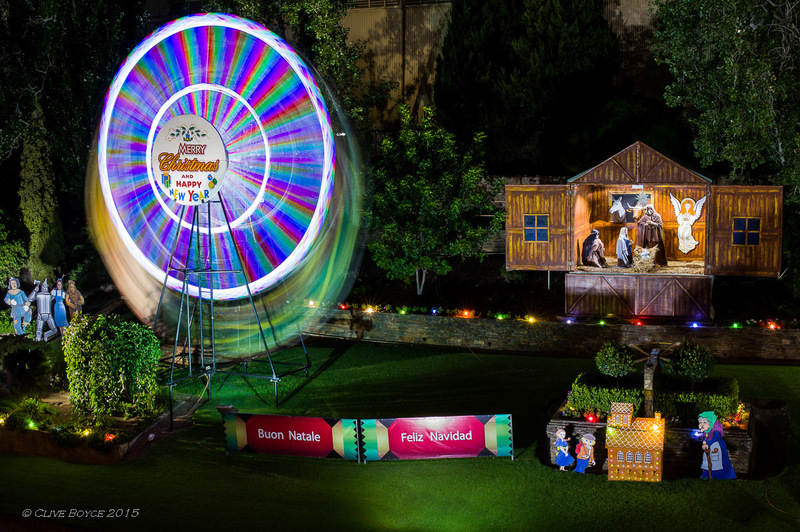 This entry was posted in Adelaide, Places to Visit and tagged Adelaide, Adelaide Christmas Lights, Christmas 2015, places to visit, South Australia, West End Brewery Christmas Lights on December 31, 2015 by aussiesouthlander. A few weeks back I granted myself an extra long weekend, taking a few days annual leave to fly to Queensland’s Gold Coast to visit a friend. On the Sunday morning, we walked down to the beach to catch the day’s sunrise (see Gold Coast Dawn). 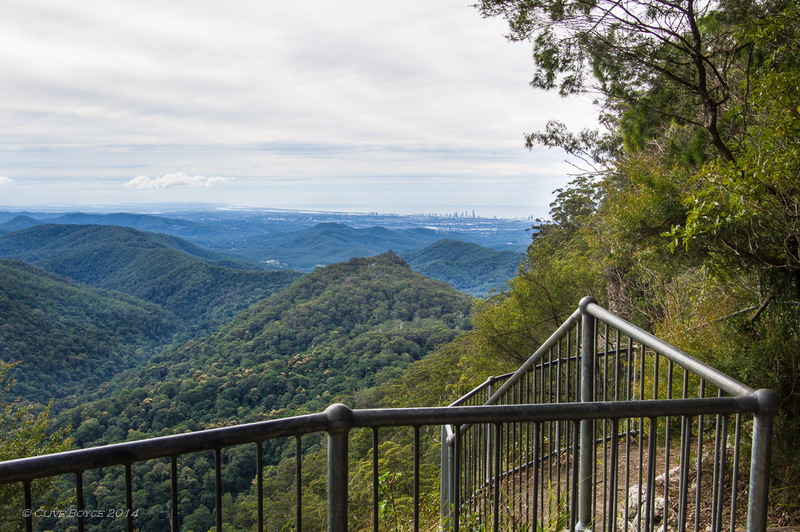 The following day was a work day for my friend, and he kindly lent me his car so I could head up into the hills behind the Gold Coast and spend the day exploring beautiful Springbrook National Park. The park is in the Great Dividing Range that extends along the entire east coast of Australia from tropical Cape York down to the Victorian snow country, and is classified as part of the Gondwana Rainforests of Australia World Heritage Area. Let’s start with something of a positioning shot atop the Springbrook plateau looking down the canyon. Broadwater and the Surfers Paradise highrises are visible in the distance. The week before last I granted myself an extra long weekend, taking a few days annual leave to fly to Queensland’s Gold Coast to visit a friend. 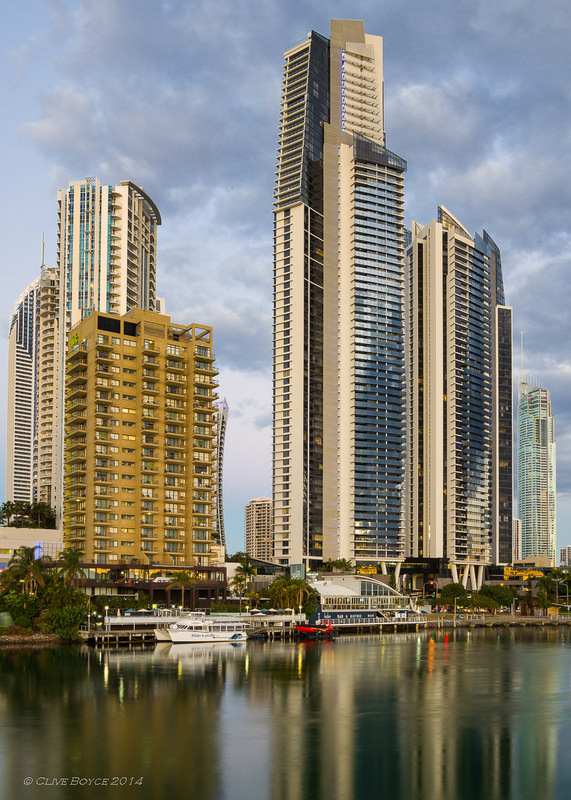 My friend Karim lives right in the heart of the Gold Coast at Surfers Paradise and his home is only a few minutes walk from the shopping/bars/restaurant area and then onto the beach itself. On the Sunday morning, Karim, his boarder Sayuri and I walked down to the beach to catch the day’s sunrise. And a glorious sunrise and morning it was, as this sequence of photos taken over 30 minutes or so illustrates. 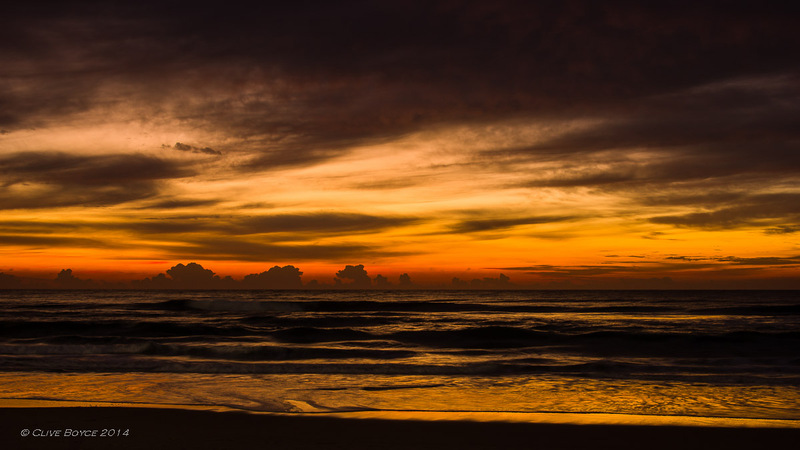 This entry was posted in Australia, Other States, Places to Visit, Queensland and tagged Dawn, Gold Coast, Photography, places to visit, Queensland, Seascapes, Sunrise, Surfers Paradise on June 10, 2015 by aussiesouthlander.